A ribbon-cutting was held today for a new landscaped plaza in front of the historic Lankershim Train Depot. Metro riders, residents and visitors can now congregate in a lush garden just steps away from the popular Metro Orange and Red Line transit stations. Metro has built an 8,500 square-foot natural oasis that features trees and plantings, a new pedestrian thoroughfare, outdoor seats and overhead lighting. Canary Island date palms and olive trees provide an iconic visual identity to the corner of Lankershim and Chandler boulevards. Metro’s “California Garden”-inspired theme is a tribute to the State’s early horticultural beginnings, and includes colorful and drought-tolerant perennials, California natives and succulent accent plants. 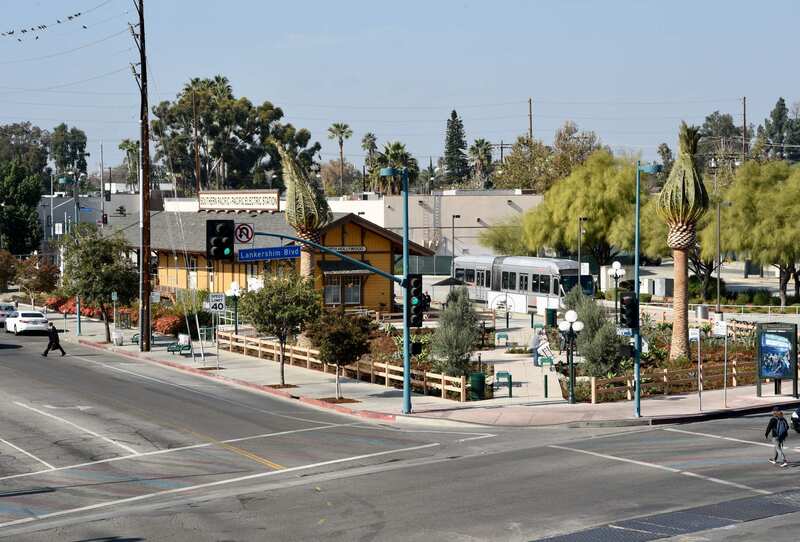 In developing this corner of its transit property, Metro sought to re-create a thriving public space that was originally built at Lankershim Depot around 1914. The park was used for town concerts and local events. At the time, Lankershim Depot served as an active station for the Pacific Electric Red Car, Southern California’s first passenger rail system. The Red Cars transported Angelenos to and from the rural but increasingly urban San Fernando Valley. Metro’s landscape contractors, Mott-McDonald and Anil Verma Associates have implemented the concept of sustainable development for the new landscaped plaza, which includes low water usage and highly efficient irrigation systems. Plantings were specifically chosen to thrive in drought conditions. Metro is also extending water conservation efforts throughout the Metro Orange Line corridor. The agency is in the process of converting the irrigation systems from a potable water source to recycled water source. Drainage swales will be used along the line to provide natural drainage and recharge the groundwater system. Prior to construction of the landscaped plaza, Metro used the lot as a construction staging area for an underground pedestrian passageway connecting the Metro Orange and Red Lines and later for a new Groundwork Coffee within Lankershim Depot that opened in February 2017. Metro fully restored Lankershim Depot in 2014. The $3.6-million restoration project, with partial funding from the former Community Redevelopment Agency, included building new foundation and roof, electric and plumbing systems, platforms, signage and seismic upgrades. Metro also restored sidings, eaves, windows and doors. Originally built in the 1890s, Lankershim Depot connected the region’s agricultural industry to the ports. In 1911, the Pacific Electric Red Car line opened at this station and stayed in operation until 1952. It is the Valley’s oldest unmodified railroad structure. Just a few months ago, I saw an irrigation spigot that was turned the wrong direction, and was spraying huge volumes of potable water all over the concrete but not on any vegetation (across the street, near the Red Line entrance). What a waste. I called it in, but do not know how long it took them to correct it. I also saw a similar situation over by the Metro bus station in Universal City. There is an app called “Solocator” a GPS field camera. it shows gps coordinates and other specifics posted right on the photo itself. I’ve used it when volunteering finding graffiti far into local parks and trails. It may help Metro maintenance identify the location a bit more accurately.